I was often asked why from my point of view Windows Phone 7/8 has no future and Microsoft is not capable of creating mobile OS. Every time I give partial answers, because the full argument will take too much time and space. You cannot express in a couple of sentences all moves of the company, which turned into a never-ending stretch of mistakes, downsides and failures. These problems have nothing to do with products, but are caused by wrong ideas and people behind strategic development of Windows Phone. Unfortunately, the employees entrusted with WP 7 have no proven track record in developing and marketing mobile devices. The story of Windows Phone 7 is an illustration how huge budget and unlimited opportunities do not necessarily translate into successful products. Subsequently, I decided to dot all the i's and come up with facts, which make me believe Windows Phone 7 to be nothing, but a colossal failure. Be patient as we will start with sales figures and then move on to all points relevant to the success and popularity of Windows Phone. Two dozens of pages will be required to describe in detail all WP7 related topics and evaluate the prospects of WP8. Failures of Microsoft in the mobile department have to start with Windows Mobile and reasons behind its demise. Having started this article I came across one material, which explicitly puts forward all reasons for the failure of Windows Mobile, so feel free to commence there. Nevertheless, we cannot forecast the future. The intriguing questions is if Windows Phone 8 will offer the working ecosystem for the first time, will avoid several problems of WP7 and will boast tablets. Is it too little too late? The answer is blowing in the wind, but the analysis of Windows Phone 7 helps to pinpoint main problems and weak points in the current Microsoft strategy. It depends solely on Microsoft if it can reach its full potential in this segment. The article will be published in three sections to make for easier reading. We always give an opportunity for every company to express their position and we followed the same pattern here. As a rule we do not show articles to companies prior to publishing them, but this time we made an exception and Microsoft representatives saw the text among the first. Our offer was simple. Microsoft could share their vision of the OS and related products. The company was happy to join in and you can read about their impression from Windows Phone 7. To be honest I had not read it before I finished this article. The difference of opinions is always beneficial and the positive reaction to criticism makes the company even stronger. I would be happy if you read both materials and rate them in Vkontakte or G+. To understand why Microsoft never boasts mobile devices sales figures look at the string of failures in this segment. The best illustration is the first year of Windows Phone 7 on the market. In 2007 Microsoft decided that reporting sales of “Mobile and Embedded Devices” will highlight only their losses in the absence of any viable strategy for Windows Mobile. Judging by the financial report from the company the income of 2 million dollars in 2006 was related not to the improvement of the situation, but with transferring losses to MSN. Starting from 2007 Microsoft classifies all mobile devices to Entertainment and Devices Division, which is convenient to hide mobile phones sales in gaming products segment. For example, let's look at Microsoft financial report for 2011 (between July 1, 2010 and June 30, 2011). Revenues of Entertainment and Devices Division reached 8.716 billion dollars with XBOX bringing in 8.103 billion dollars, which leaves 613 million dollars spread between mobile devices, Zune, service subscription, MediaRoom and other departments. Take into account that Windows Mobile 5.x/6.x sales are still with us and give the lion's share of Microsoft smartphones within the period. Officially Microsoft commented only on two figures related to Windows Phone 7. On December 21, 2010 Achim Berg, vice president of business and marketing for Windows Phone in his interview on the company's blog mentioned 1.5 million sold handsets on Windows Phone 7 and acquired by carriers. It is a good result for the first 6 weeks on a limited number of markets, but devices shipped or bought by carriers are not equal to phones purchased by consumers. According to Berg shipments met the corporate expectations, but it is difficult to compare with rival OS. For example, Google activated 300,000 Android devices in December of 2010 every day and these were phones snapped up by customers. You can ship as many phones as you produce, but the key point is to sell them, which is not easy for Microsoft. At the end of January Greg Sullivan, senior product manager at Microsoft remarked that companies received 2 million copies of Windows Phone 7 in the previous quarter, but this figure adds nothing to our understanding of Windows Phone 7 sales in the fourth quart of 2010, because OS copies do not equal the number of manufactured phones. 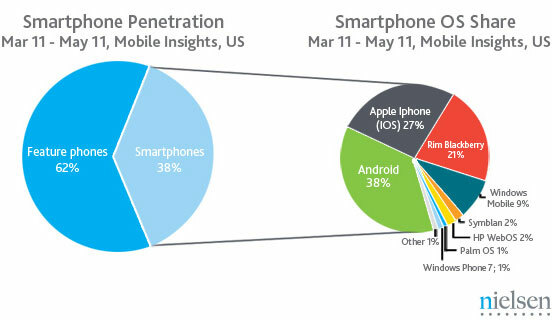 In terms of sales we are interested in absolute numbers rather than in the market share of WP7. Compared to the first quarter of 2010 we see no increase in sales. In the second quarter of 2011 sales plunged to 1,723.8 thousand handsets and remained at the same level of 1,701.9 thousand in the fourth quarter of 2011. The stability of sales can be contributed to the massive promotion of Windows Phone 7, but the market did not embrace them, hence came the slide. We still did not get the number of Windows Phone 7 sales as Gartner combines it with Windows Mobile. The only help can come from the Nielsen research, which questions smartphone owners in the USA. We don't need the absolute numbers, but the ratio between Windows Mobile and WP7. This is what Nielsen found in its review conducted from March to May of 2011. The ratio between WP7 and old Windows Mobile versions is 1 to 10, which is staggering. Microsoft was always strong on the secondary market, but it is still remarkable that WP7 failed to overtake the sales of dated OS. In the third quarter of 2011 Windows Phone 7 figures from Nielsen show that Microsoft hardly knows what it is doing. A short account of Windows Phone 7 sales in its first year after unveiling is important as it explains how Microsoft manages data and hides true indicators. Above-mentioned numbers also clearly explain why Windows Phone 7 cannot be considered a success. WP7 fans often claim that Microsoft needs more time and then everything will be fine. They also refer to Android and iOS, which also endured hard times at first. Nevertheless, we cannot agree with the statement, because both systems showed continuous growth measured in triple digit percentage points. The Microsoft product started with a bang followed by a downward slide due to the lack of demand. On the growing market it means that the company failed to come up with the product required by customers. Microsoft shifted the blame onto sellers, who allegedly could not explain the people why Windows Phone 7 is so good. In June 2011 some people came up with an idea that the US retailers were hampering Windows Phone 7 sales. PCMag posted an article of an 'undercover buyer' who researched carriers' stores. His conclusion was that the retailers are set against WP7. It is not important who initiated this 'investigation': Microsoft, to make some hype, reporters or WP7 fans. It is important that Microsoft have revealed their attitude towards the retailers. On June 13 2011 PCMag posts a short article featuring an interview with Greg Sullivan, Microsoft Windows Phone product manager, who tries to clarify the company's stance regarding the issue. He said that MS was focusing on training of retailers and would not be offering cash bonuses for WP7 sales. 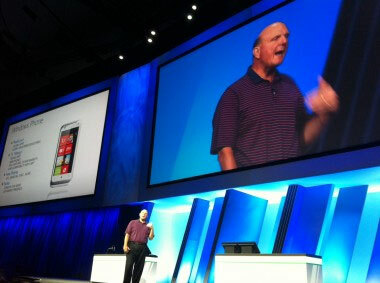 He also mentioned that as soon as Nokia begins shipping WP7 phones it would improve Microsoft's retail situation. Let's now see what misconceptions Microsoft have and to what repercussions it may lead. I must add that there stance has not change a bit since summer 2011. There is practically no difference in the work of retail salesmen be it in the US or Russia. The difference is only in the amount of the bonus they get from sales. It is similar to the income of a waiter who gets most of cash from tips. Sales bonuses are a clear and transparent motivation system that drives sales associates to sell more expensive. So if you sell a low range phone you get almost nothing but if you sell a flagship you get a sizable cash bonus. The bonus is awarded after a certain period of time, say one month. So if the buyer returns the phone the salesman get no bonus. Thus the salesman is motivated to keep the buyer happy with his purchase otherwise he gets no bonus. Manufacturers include the sales bonuses into the price of every phone. The amount of the bonus varied slightly depending on the market situation. So if Samsung sets a $25 bonus margin then so does HTC for a similar model. The market responds very quickly and a manufacturer cannot exercise his own bonus policy without his competitors responding to it. Thus the sales bonuses are about the same and it is hard to get ahead using it. Any change to the bonus policy will immediately cause the rivals to adjust their policies. The retail chains also use a policy of hefty bonuses to get rid of unpopular products. The big bonus is intended to motivate the salesman to sell a phone despite a great return chance. Between the manufacturer and the retailer there is another link – the OS developer. Every developer wants his OS to get the biggest market share. But since most of the marketing activities are the domain of the carrier and the manufacturer Google and Microsoft have to train salesmen or promote the entire model range of the phones running their OS in which case the OS developer has to bring all the manufacturers together in a single promo e.g. you buy a WP7 phone and get a discount for Windows 7. The OS developer does not need or have to pay individual bonuses to salesmen as it is the manufacturer's job. Now that you know about how a salesman gets his bonus you can guess why they don't like WP7 so much. It's easy really – people return WP7 phones too often. Windows Phone 7 smartphones are the most returned phones on the market today. In Russia as of December 2011 for every 3 returned WP7 phones there is 1 returned Symbian smartphone and just 0.12 returned iPhones. People don't get what they expect from WP7 phones so they return them. Salesman don't want to sell them because they want to get a bonus from a phone that won't be returned. Microsoft Misconception 1. Concerns the belief that MS does not pay bonuses for WP7 sales. It is simply not true and a part of the promotion cash goes to sales associates. The difference is that Microsoft does not pay the salesmen directly. Google, on the other hand, does not offer marketing support for manufacturers, instead, they pay salesman bonuses directly. If Microsoft ditches the manufacturer support program it will inevitably result in even poorer sales. MS find themselves in a vicious circle which the current management is unable to break out from. Microsoft Misconception 2. Is about the myth that since Nokia is onboard with MS it will solve all the retail problems MS have been experiencing. It is also not true as Nokia is forced to work just as any other manufacturer MS has worked with. MS did not give Nokia any exclusive rights. And as far as the US market is concerned Nokia simply does not stand a chance against Samsung, the number one in sales. Unfortunately, these misconceptions seem to have rooted deep inside the company and are not associated with any particular manager. Stephen Elop, Nokia's CEO, even blamed sales associates for poor WP7 sales and I quote his words (January 2012): “want their commission and tend to only show phones they think might sell”. Stephen has described the retail market very precisely. I find it curious how Nokia who knows the rules managed to have good sales and was satisfied with how the retail works. However, as soon as the company switched to WP7 their attitude changed – it must be some sort of a Microsoft directive I mean Elop must have been citing the MS stance on the issue. Until Microsoft creates something that users actually want the retail will not be putting too much effort into selling their products. Any forced sales are doomed to result in returns so Microsoft is left with only two choices either add something desired to their products (like a free XBOX360) or come up with bonus programs that would make WP7 products worth the time of sales associates. Naturally, both ways are quite pricy and Microsoft are not ready to implement them on a regular basis so far. The way Microsoft is working with retail chains deserves a separate article. MS trainers avoid any comparison of WP7 with Android because unlike salesmen they don't know this OS. They also cannot show the strong sides of WP7 and Q&A sessions turn into a 'hit a trainer' game when sales associates enumerate things Android can do and WP7 cannot. I think these are the reasons why Microsoft does not analyze the return rate of WP7 phones but calculates some 'user satisfaction level' using a very secret formula. I believe that the simplest and the most honest way to see how much users are satisfied with a phone is to look at how long they use it and, of course, the return rate to stores. Microsoft believe that retail sales associates are ignoring WP7 phones. Microsoft cherish illusions that Nokia can change the WP7 image. Microsoft are underestimating the retail (including carrier retail) and pay too little attention to it. One of the time bombs Microsoft put into Windows Phone 7 is the standard licensing procedure. MS is a company that has been successfully profiting from selling software licenses – a simple and clear business model. Microsoft sells a WP7 license and gets the fees. This model worked fine for Windows Mobile back then there were no alternatives to this mobile OS. Unfortunately for Microsoft the market has changed a lot since then. Microsoft have never voiced the amount of the license fee for a single copy of WP7. Nokia Q4 2011 financial report states a $250 million transaction from Microsoft for support of Windows Phone 7 products but no license fees from Nokia. It is possible that the license fees are calculated in other transactions between the two companies. The only veritable information on the licensing fee comes from a ZTE UK Santiago Sierra product manager who mentioned that the WP7 license fee amounts to £25-30 ($30-40). This news was a bombshell and has never been denied by MS.
On the other side of the spectrum there is Google who asks exactly NOTHING from Android OEM manufacturers. Google is using a free distribution model of their OS. In 2011 Microsoft carried out a massive licensing attack on the major Android manufacturers including signing a cross licensing agreement with Samsung. Back then t was more of a marketing campaign as the cross licensing agreements covering mobile phones had been signing long before the news was announced. It was a Microsoft's desperate attempt to make smaller Android OEM manufacturers pay the fees, most importantly the Chinese manufacturers. I polled a number of Chinese Android manufacturers and learned that none of them pays the MS fees so the licensing initiative failed. It is however, unclear how much the major Android manufacturers pay for WP7 license but considering MS financial reports the sums are insignificant. Why I think that the licensing model is doomed to fail? The reason for that is the number of the current WP7 manufacturers that can be counted on the fingers of two hands: Asustek, Acer, Dell, Fujitsu, HTC, LG, Samsung, Nokia, ZTE. Guess how many manufacturers produce Android smartphones? Over sixty including small Chinese manufacturers. Back in the times of Windows Mobile the situation was opposite – there were over fifty manufacturers working with WM devices. But that was a result of a no alternative situation. Today manufacturers have a free alternative – Android. The Chinese manufacturers can use Android in their devices and not be afraid of any legal prosecution and they come up with a plethora of devices to any taste. The entry ticket on the WP7 market is way too expensive and the first part of it is the license fee. The second part is the requirement to use expensive components in WP7 phones which do not affect the user experience and make the competition between the OEM manufacturers pointless. 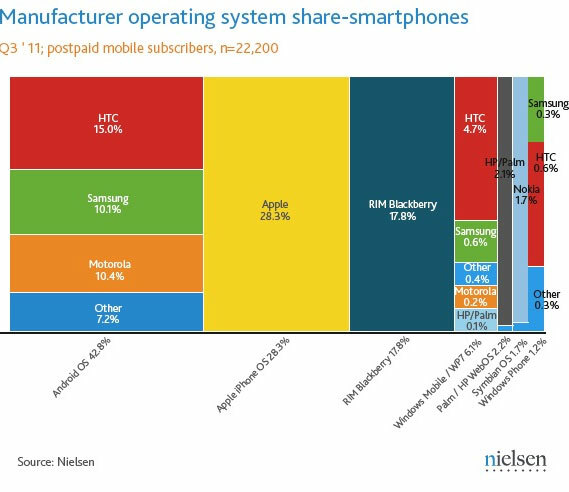 The result is the handful of manufacturers who work with WP7 and a total lack of interest from smaller manufacturers (who ship tens of millions of devices every quarter). The license fee together with hardware requirements doom WP7 and WP8 to fail on the market. The only major acquisition of Microsoft in 2011 was Nokia who chose WP7 but its sales show that they chose wrong and even the obsolete Symbian still has higher sales. Who can look at any statistics to see how fast the number of Android devices is growing and just how few WP7 phones there are out there. The conclusion I want to draw is that any mobile OS that has a license fee is doomed to lose the competition to Android. The reason for that is not only the cost but also the fact that Android is extremely popular now and the zero fee makes it even more attractive to manufacturers. In the next part I want to discuss hardware requirements Microsoft has imposed on the WP7 market. While there is Android which is completely free to OEM manufacturers the fees are a big obstacle between WP7 and new manufacturers. Microsoft are unable to implement a different business model and as a result they are losing the competition to Android.